Lilly Belle & 'Ol Saint Nick himself! Ho, ho, ho. . . .
Well here it is early Christmas morning and I'm waiting for the 2-legged dwellers of this place to get out of bed and continue with the festivities of yesterday. Man, I like it around here when they start bringing the outdoors inside, potted trees, hanging bright lights and decorations all over the place... so much to get into and so little time! 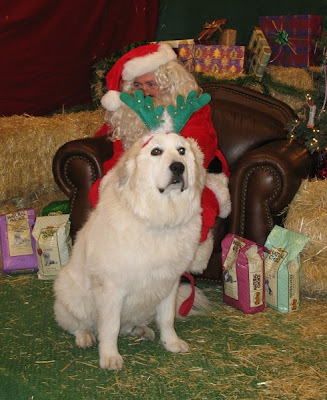 Oh yeah, that's me (your favorite Great Pyrenees pooch) and some funny dressing guy called Santa Claus. He fed me cookies to pose beside him so that he could get his picture taken. Mom giggled the whole time, but dad seemed embarrassed and kept out of sight. Today should be fun like yesterday was; seemed that everybody was feeding me treats I'd never tasted before.... mmmmmm good! I'm not sure if this was the reason I bugged mom 3 times last night to go outside. I know she doesn't mind, I think she likes it when I wake her up when it is dark and she gets dressed to go out in the snow with me. Hey, I could hold it until next Wednesday if I wanted to, but I know she enjoys this special time together with me. Wait... what's that? Either one of those danged cats to chase or one of the tall critters are stirring. It must be time to start playing Christmas again. I REALLY like this time of year, I guess you do too! Sooooooooooooo . . .
Not just whoof, but.... WHOOF! Pack leader here... I now know why they call this the "dog days of summer". We've just had the hottest, driest July I can remember. Forest fires are raging to the east, north and south of us, and there does not appear to be any rain in the immediate forecast. Our Great Pyrenees, Lilly Belle has been lethargic to say the least. That fur coat she wears is not making her life any easier. And the cats... Puff and Pooh always try to conserve their energy, but I think they have enough stored up to stay awake for the next month. Even little Minnie (the mouser) prefers to hide out in the garage instead of sniffing around for fresh rodent meat. And even the 'ol pack leader (that's me) has had trouble raising the energy to keep this blog current. I don't know about you friends, but this is one dog who is ready for fall and some cooler weaher! I just discovered a wonderful video on YouTube about Great Pyrenees dogs. It is a well done video describing the characteristics of Pyrs. If you want to know more about this fabulous breed of dogs, watch this video. Oh and BTW, all of us 2-legged and 4-legged bloggers would like to wish you and your family a happy and safe Saint Patrick's Day! Minnie: Give me a break! Mice are rodents, they carry diseases and scare the hell out of women... I do the world a favor when I munch a mouse for lunch. Lilly: Not if you're a mouse. Minnie: You're probably just jealous that I got to that mouse before you did. After all, you eat skunks! Minnie: Forget it, I'm going out for lunch. Ever wonder what keeps mice awake at night? Hi, I'm Minnie (the mouser) - as my dad likes to call me. I alone am responsible for clearing the prairie dogs from our five acre home site. When my family first moved in, they didn't see a prairie dog that first summer because the previous owner had a cat. The next summer mom and dad saw a few of those rodents and thought they were cute. Right. By the third summer, prairie dogs were hanging out at every tree, why there must have been a hundred of them. Then I showed up, and I can't remember ever having so much fun. Some of those dogs were as tall as me, but they never stood a chance. Yup, I put on a lot of weight that year. Today I have to work harder to amuse myself since the prairie dog population has dwindled so. 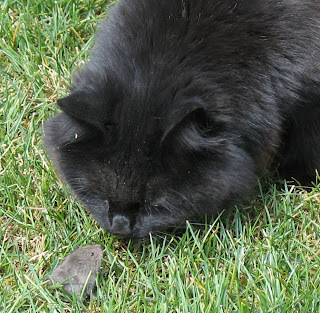 These days all I can find are mice. Don't let anyone fool you, a mouse is not as tasty as a prairie dog and they don't hang around chatting like those talking rodents. If you were a mouse, I would imagine that this picture is the stuff that nightmares are made of. I brought this mouse up to the door so dad could see me having fun and he snapped a couple pictures to remind me of my summer vacation. I do know how to have fun! PS: If you want to see more of me, come visit me at my "Cat House"! PPS: Maybe later dad will tell the story of my big sister, Lilly Belle who tangled with a skunk. 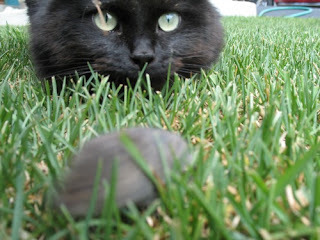 The skunk suffered the same fate as this mouse... but IMHO, Lilly was the big loser. Wow, did she ever stink! No sir, our purposely vague law states that anyone can have the Sheriff cite a dog owner if the dog's barking bugs them. There are no definitions as to how many times the dog can bark, how long it can bark, at what it can bark or. . . . or nothing! Dog barks – you don’t like it - call the Sheriff. Got a neighbor you don't like who has a dog? Call the Sheriff. What a great way to drive a neighbor to the brink – but it is not working. We chose to pursue our legal rights as we feel that our dog should be allowed to bark at the bears, mountain lions, coyotes, and drivers who are lost and think our paved drive is a road. Toss in the UPS guy, Fed-X, mail carriers and other neighborhood distractions and . 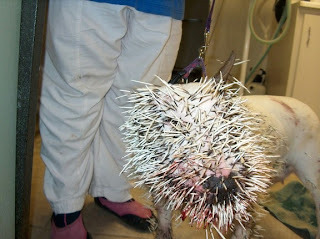 . . these are the reasons we have a dog that barks and protects us on our tiny 5 acre plot. Well Tuesday was the day for our "omnibus hearing", where we met with a judge and the county prosecutor to discuss our side of the case and decide if we wanted to pay a fine or go for a jury trial. It should be noted that each of the citations required a separate trip to the courthouse to plead not guilty. Today was our 4th. trip to the courthouse on this matter. The neighbor? All he has to do is dial the phone. We were prepared. We believed that we could demonstrate that the County’s barking dog ordinance is extraordinarily vague, lacks any definition, provides County officials and dog owners no reasonable guidance, and is blatantly unfair to all dog owners in the County. We believed that we could establish that this county-wide ordinance, when applied to rural areas, violates personal freedoms, the State Constitution and the Code of the West (seriously, that's real). We also do not believe that one unfriendly individual should have the power to dictate standards to an entire community. We were ready to do battle, armed with color photos, letters to the Sheriff, emails of support from neighbors and highlighted copies of the State Constitution and the Code of the West, and a stack of supporting documentation (my bride is like, well - a dog with a bone when it comes to research - no pun intended). Tuesday during our hearing, we learned that if we go to court and win - nothing changes. The only thing we "win" is absolution of a small fine (in this case, three fines). Our neighbor can call the Sheriff that day and we begin the cycle all over again. We paid the fine. The thought of yet another future trip to the courthouse to gain absolutely nothing seemed like a waste of time. So there you have it, one disgruntled neighbor can dictate his will to the entire community. But wait, we're not done yet. We have a plan and this plan is a humdinger! No, nothing illegal or even morally or ethically questionable (unless you agree that our legal system is morally or ethically flawed, but that's a debate for a different blog). 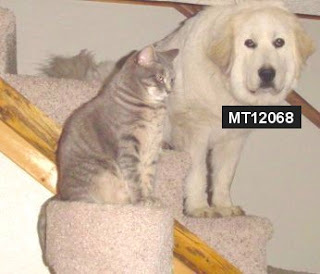 We KNOW our neighbor is not a dog lover, so it is improbable that he subscribes to this blog, but we will save our plan for a future post - AFTER - we've accomplished our mission of getting our neighbor and our Great Pyrenees to live in harmony and peace. In the meantime, I've got to go straighten-up the house for the next deputy Sheriff's visit. PS: And BTW, the Sheriff and all the deputies we have met (5 now) are just outstanding, professional and courteous people. Lilly: Puff, Pooh and Minnie... did you cats see me in the parade yesterday? I was the star, mom told me so! Pooh: What parade? I must have been sleeping. There was a parade? Why didn't someone wake me? 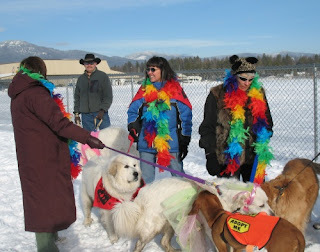 Lilly: Yesterday, they held the annual Whitefish Winter Carnival and they had a huge parade, and I walked with about 12 other dogs from the Northwest Montana Humane Society. We were awesome - we were the hit of the parade! Mom told me that was true. Puff: Yeah well, mom isn't one to always tell the truth when she's talking about you, Lilly. I mean after all, she does call you "Puppy Love". What could be further from the truth? Lilly: Hey, this was a big deal, they've been holding this parade for 48 years. This year I was the star. One short human called out... "Hey look a Polar bear"! Pooh: Well, too bad hunting season is over, you'd look good hanging on somebodies wall. Lilly: Pooh, they stuff cats too, ya know! And besides, no one would shoot "Puppy Love". Minnie: I would, will you show me how? Lilly: You ladies are so "catty". Go back to sleep! That's what you do best anyhow. Pooh: Hey Puff, mom wanted us to show everyone how dad built a custom made "Cat Tree" for us. Puff: Don't tell anyone, someone might see it and ask dad if they can have it. Pooh: We can't keep this quiet, heck dad posted the instructions on our website! Puff: Oh great, now every cat in America will have a scratching tree like ours. Pooh: That wouldn't be so bad. Just imagine if every cat in the country was as happy and contented as we are? Puff: Yeah, maybe you're right. Okay, go tell everyone to go see our cat tree here. Lilly: They're back . . . do you remember me telling you that the long arm of the law reached out to me as a result of our neighbor calling the sheriff because I bark? Remember this conversation? Well, they were again called in to issue mom & dad a citation because I do what I'm supposed to do... bark! Puff: This is so cool, Lilly the 'outlaw dog' - living under our roof... or should I say you're hiding out here? Lilly: Yeah, can you believe this guy keeps calling the sheriff! He never calls mom or dad, just calls the sheriff . . . what a strange person we have living next door. Lilly: Of course I'm guilty... I bark! Puff: That guy must be like me and Pooh, he must not like dogs. I can't blame him, of course. Lilly: Well I can tell you that dad is getting tired of this. He went to the Sheriff's office the other day to see if there was anything he could do to help solve this problem. He and the Sheriff talked for a long time and the bottom line is that mom & dad are going to go to court next month to get this taken care of. Puff: Will they arrest you or dad? Lilly: They will only arrest me when I start attacking cats that think they are funny!!! No one is getting arrested, the purpose of the court hearing is so that everyone can tell their side of the story and a judge (who I hope likes dogs) will decide who is right. Puff: What's with our neighbor? How come he doesn't just ask you to shut up, or ask mom to gag you? Pooh: Hey Lilly, last week I told you that Puff and me are movie stars and had one of our videos featured on YouTube. Lilly: Oh yeah, I'm still trying to figure out why anyone would take time from their day and watch two cats sleeping. I'd rather watch paint dry. Pooh: Well I can tell you that almost 600 very smart people disagree with you because that's how many times our movie has been watched by an adoring public - who are asking for more!!! Lilly: You have got to be kidding me. People are THAT bored? Pooh: Boredom has nothing to do with the appreciation of fine artistic productions and two magnificent movie subjects. I can see it now... "The Adventures of Puff and Pooh" - how two beautiful kittens defend themselves from a polar bear-looking dog and lived to tell their tale. Lilly: You are a sick cat. Someone must have told those 600 people that mom was giving away free dog bones or something. Pooh: Think what you want, all I know is that Puff and I now have a following. And, due to the many requests for more, I'm going to point everyone to our famous movie... "Where did the water go?" Lilly: You won't mind if I check it out later, right now I have some important things to do... mom needs some animal-therapy and the best thing that helps her cope with you two cats is by loving on a big dog like me. She needs to hug me and rub me all over... doesn't do much for me, but she seems to like it. She calls me her "therapy dog". Pooh: Wow, and you think people are bored because they watch our movies? How bored must mom be?